Upon arrival at the resort where we were staying in Australia, I realized that my military ID had vanished. Crap. I had it in Sydney, so my thoughts were that between boarding in Sydney and arriving at the resort, it had fallen out of my pocket. I was crushed. Seriously. 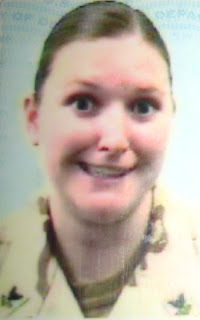 I'm not sure if you remember the great ID debacle of 2011.
Who would want to replace that face? A fair alternative to the above photo. I was completely satisfied and even proud of that ID. It was a subtle funny... you didn't see it unless you really looked at the photo. I called the airport in Sydney and in Perth to check and see if anyone had turned it in to lost and found with no luck. Considering the way the entire Australia DET started, I wasn't really surprised to have lost my ID, it was par for the course by that point. Nonetheless, no ID meant having to get a new one when I got back to Pax River. My first day back to work, I had to explain to the gate guard that I had lost my ID in Australia on DET and he said, "Well, thats a story I've not heard before." I offered to show him any of my other 5 forms of ID (oh yes, literally 5: both passports, birth certificate, social security card, and driver license), he said that would be ok. I have a funny face standard to uphold, and I talked this issue over with Teh Bear on one of our limited Skype calls while I was in Australia and he suggested I do "wide eyes". I couldn't seem to practice that on Skype because I kept giggling, probably because Teh Bear was staring at me. He suggested I practice in front of a mirror, but soon after that call, it was time to leave Australia and I promptly forgot what I was supposed to be doing in front of the mirror. When I got home, I realized there was something Teh Bear and I had discussed, something to do with the mirror, but I just couldn't put my finger on it. When I went to PSD and sat down in front of the camera, I remembered!!! Practice wide eyes! I didn't get to practice, but I warned the lady I wanted to have a silly face. She said, I can see from your last photo that must be your goal every time. Smart lady. It was then time for the photo. It only took one shot this time around. It was wide eyes and big smile, with a little bit of front teef showin'. An extremely satisfactory substitution for the last photo. It's ok if you wish you were this awesome. Hopefully, I won't have to get another ID since this one doesn't expire till my EAOS (my last day in the Navy). Seriously, that is a face full of win. PS. Teh Bear says that the current ID photo is my excited face..... Which is pretty scary.